If your event includes a presentation or performers, your stage should be the focal point of the room. But where should it go? The front of the room may seem obvious, but is that the best location? If people can’t comfortably see the action, your event will be a bust. 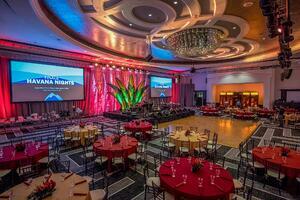 These tips will help you determine the best event staging for your space. Hint: Get your AV team involved in planning right from the beginning. That way, you can avoid overlooking vital details and get the best show on earth (or at least on your stage) for your budget. Ask what your speaker or performers will need in the way of setup. This directly affects stage size and other event staging details. Ideally, your audience should be seated only in front of the stage, not off to the sides or (horrors!) to the rear. Oblique angles make viewing tough and make it hard for entertainers to eyeball their audience. Start the first row of seating within five feet of the stage. Proximity is more engaging, giving the show a more intimate, one-on-one feeling even if the crowd is large. Make sure there are no pillars or other sight line barriers to ruin someone’s view of the stage. (This should be a consideration in choosing your venue.) If you’re stuck with columns, arrange seating to account for that. Make the stage the center of attention. Put other “action” centers (buffet, bars, etc.) to the sides or behind the audience, so nothing will distract (or detract) once the show begins. Dressing the sides of the stage with props will make the stage appear larger, if necessary, and also draw the audience’s eye toward the center. Rigging will be one of your most important considerations. Sound, lighting, and/or special effects equipment are critical for production, and everything takes up space, whether on-stage, on the periphery, or located remotely around the room. Ceiling height and strength can be challenging in hotels and conference centers. LED lights can be extremely helpful because they are versatile and come with the added benefit of requiring less power, an important consideration with some venues. With a wall or corner behind your stage, crews will have more space for setup and live production. Raising the stage improves visibility and provides room to hide equipment underneath. If the room has an existing video wall, lucky you. Use that as a backdrop. If your stage is small but you’ll have a sizeable audience, use stage elements that are large and simple enough to deliver the impact you want, even to the back rows. If the on-stage action requires last-minute setup, put your pre-function reception in a separate space until show time. This doesn’t affect stage placement, but it will build excitement for the presentation or performance. Remember to allow ample time for setup and run-through, even if you have to pay for more hours or days of room rental. You want your event to be flawless, and assuming everything will be fine is dangerous. Double-checking every technical detail of your event staging is cheap insurance.